Office 2010 includes a built-in PDF writer to help you save any document into the PDF format at the click of a button. 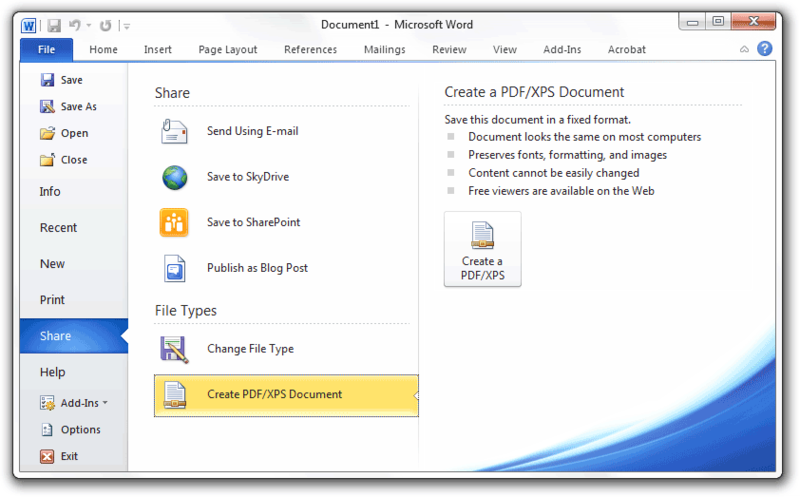 You can also convert documents to PDF and email them as attachments directly from the Office program. To save a document as PDF, go to Share -> Create PDF Document. Alternatively, you may use Share -> Send Using E-mail -> Send as PDF to attach a PDF copy of the document in a new email message. Office 2007 users can download the free "Save as PDF" add-on to export files as PDF format in their Office programs.